Is 50 really friends with all these people? 1. 50 Cent with Naomi Campbell. 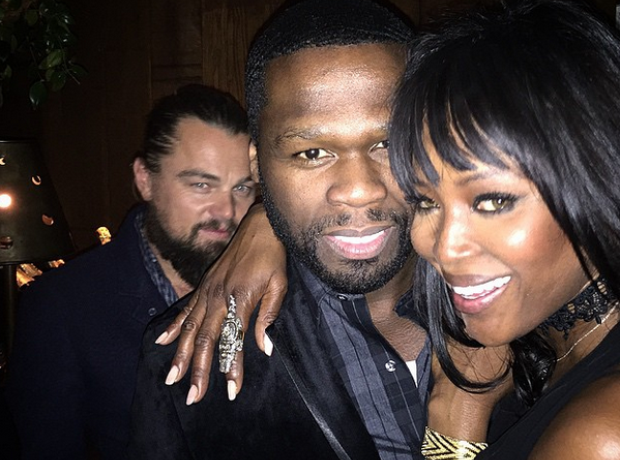 Oh and that's Leonardo DiCaprio casually photobombing. 3. 50 Cent has got the most random circle of friends we've ever seen. 4. Here's 50 cent and Melissa McCarthy's close up. They look like the best friends ever. 5. Some friends aren't too surprising, here he is with Beyoncé, for example. 6. But then, BANG. 50 Cent just shocks us all by hanging out with Meryl Streep. 8. And Gossip Girl's Chase Crawford. 9. If you thought that 50 Cent and Jason Statham was just a one time thing. 10. It wasn't. Here they are again. They're actually friends! 12. Jake Gyllenhaal is not so random seeing as they were in a film together. We'll give 50 that one. 13. But 'Desperate Housewives' Teri Hatcher? 14. And Susan Sarandon? Where did they even meet? 15. HOW DOES 50 CENT KNOW TOM HANKS?! 17. Kelly Rowland? Didn't know they were friends, but that's cool. 18. Nicole Scherzinger? Yes, we can see how that might have happened. 19. And we would be surprised if 50 Cent wasn't friends with Mary J Blige. 20. But Joan Rivers? Who knew? 22. Imagine this dinner party; 50 Cent, Madonna, Meryl Streep and Jason Statham. RANDOM! 23. Who knows, Jimmy Fallon could get an invite, because why not?